Science has finally caught up to what many of us have been trying to say for years: How you feel comes from your GUT. Restoring gut health must be part of your mental wellness program. If you or someone who know is suffering from depression, there is HOPE. And it could be a lot easier to overcome than you think. “In the gut, resident microbes take a share of every meal you eat, but in return they aid in digestion, synthesizing vitamins and disarming dangerous bacteria that you ingest. They also churn out virtually every major neurotransmitter that tunes our emotions – notably GAMA, dopamine, serotonin, acetylcholine, and noradrenaline – as well as hormones with psychoactive properties. “To varying degrees, scientists now suspect, intestinal microbes influence whether you’re happy or sad, anxious or calm, energetic or sluggish, and, by signaling the brain when you’ve had enough to eat, perhaps even whether you’re fat or thin. “Scientists are still trying to figure out exactly how gut bacteria get messages delivered to the distant output of the head, but they have a few ideas. “Some psychoactive compounds made by gut bacteria, they believe, are detected by the enteric nervous system – a think skein of neurons that runs the entire length of the gut. This network has more neurons than the spinal cord – hence its nickname, “the second brain’ – and it connects to the big brain upstairs via the vagus nerve, a major route by which gut bacteria make their voices heard. Indeed, 90 percent of information transmitted by this cable goes from the viscera to the brain, not the other way around, as science for many years had assumed. “Intestinal bacteria may engage the immune system, which can lower our mood and energy level, yet another pathway by which our microbiota might change our behavior. Perhaps related to that observation, depressed people tend to have abnormally high amounts of certain gut bacteria, and they are more likely to have elevated biomarkers for inflammation – an immune-mediated response. “Intriguingly, certain gastro-intestinal (GI) disturbances – notable ulcerative colitis and Crohn’s disease – are marked by disruptions of the gut microbiome, and these illnesses are associated with an unusually high incidence of mental disturbance in comparison to serious diseases that afflict other parts of the body. Indeed, 50 to 80 percent of those who suffer from these conditions are clinically depressed. “More surprising, specific abnormalities in the composition of the human microbiota have been linked to autism spectrum disorder (ASD) – a condition characterized by increased anxiety, depression, and impaired social ability. Could probiotics help millions of people who are debilitated by serious mood disorders? “Clinical trials are now underway to test probiotics on people whose primary problem is anxiety, depression or bipolar disorder. The results are not in yet, but studies of groups whose mental woes may originate in GI troubles offer encouragement. In one study of thirty-seven patients with functional gastrointestinal disorders (an umbrella term for irritable bowel syndrome and other common gastric complaints that can’t be tied to an underlying abnormality), for example, probiotic treatment not only improved their symptoms but also brought about a significant reduction in their depression and anxiety based on both self-reporting and measurements of stress markers in their saliva and urine. The outcome was impressive given that all of the subjects had previously been treated – without success – at multiple medical centers. “A sprinkling of clinical investigations also suggest that probiotic remedies can soothe colicky babies, a condition that torments 20% of newborns along with their frazzled, sleep-deprived parents. In one trial, the approach reduced crying and fussing by 70 percent. Probiotics can’t hurt and may help, so why NOT try? 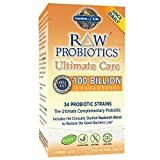 With no harmful side effects, no damage to the hormonal system, metabolism or liver, no additive properties and no need for other supporting prescription medications, I cannot see any logical reason why NOT to take a daily probiotic. At the very least, you can add a probiotic to your daily regimen, even if you and your doctor decide to keep you on anti-depressants. With nothing to lose and so much to potentially gain, it’s a no-brainer (or an all-gutter!). Even if you don’t suffer from clinical anxiety or depression, studies are showing that you can feel better too. Everyday stress can actually be reduced, just from taking good gut bacteria! I recommend several types of probiotic. Taken together, they increase the chance of rebalancing the microbiome in the gut. Remember, it’s not just one type of good bacteria that you need. There are as many as a thousand different strains of good bacteria in a healthy gut.